We’re currently working on cycling kit design and a WordPress website for the newly formed Kendal Cycle Club. The club aims to be involved in all types of competitive and non-competitive cycling, including road, track, triathlon, mountain biking, time trials and cyclo cross. We have a reputation as a friendly club and welcome cyclists of all ages and abilities. 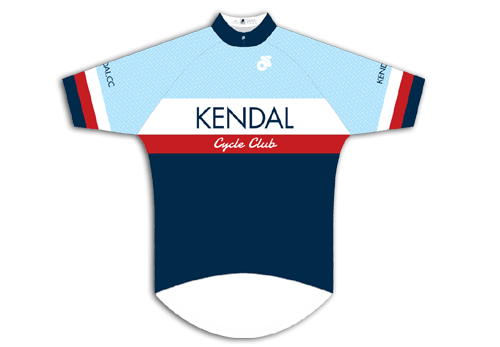 The kit design for Kendal Cycle Club kit has been approved by British Cycling. To make the design unique and to show the club’s provenance, there is an arrow pattern within the light blue. An arrow was selected because it signifies speed and direction. It also provides a link to Kendal’s history and specifically “Kendal Green” which was a hard-wearing wool-based fabric, and was sported by the Kendalian archers who were instrumental in the English victory over the French at the Battle of Agincourt.